Pay-Off - Metal Tape | Tensor Machinery Ltd. 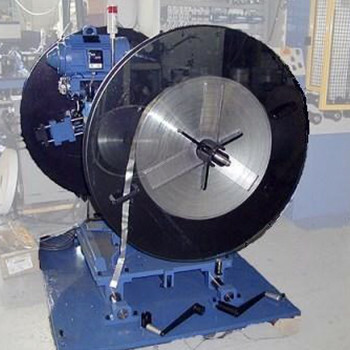 The metal tape pay-offs are designed to hold single pads of tape up to 6″ wide and 40″ diameter, depending on the design. To grip the tape pads, the pay-offs have a radially expanding chuck that grips the inner core of the tape pad. A hand crank expands or retracts the chucks for loading and unloading. The tape pad rests against a steel disc for stability. The pay-offs can be built as single pay-offs or two singles can be mounted as a pair in a swivel pay-off design. 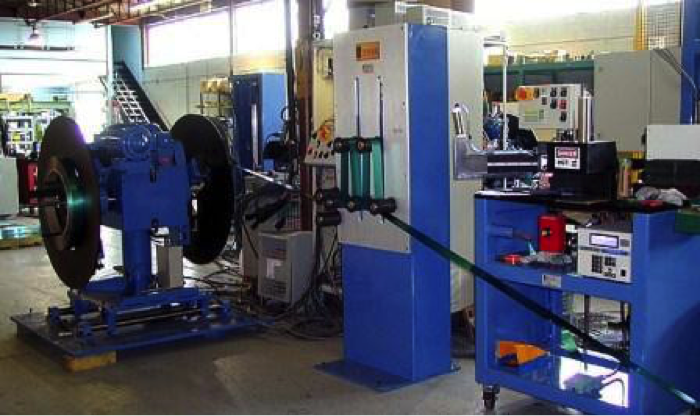 The type of pay-off used depends on the floor space available and the tape loading area. 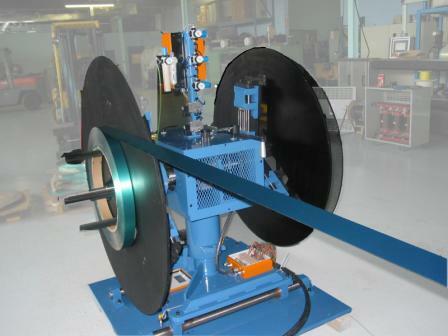 There are a variety of methods to control the tape tension during a tape run. The Basic model uses a pneumatically controlled Disk Brake that is attached to the pay-off disk. 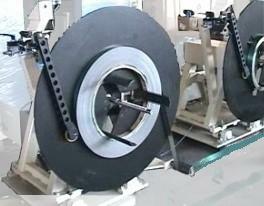 By adjusting the pneumatic pressure to the disk brake, the tape tension increases or decreases. Once adjusted, the brake torque remains the same throughout the run. On this type of pay-off, the tape tension will increase as the tape pad diameter decreases. For some types of tapes, this increase in tension is acceptable. For other types of tapes, a more constant tension is required. 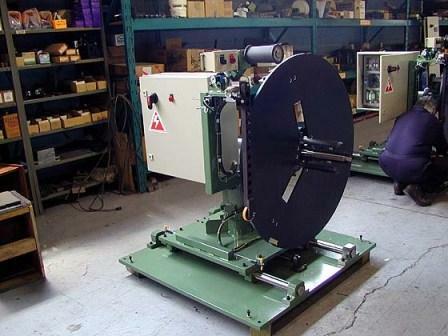 An alternative to the basic model is the Magnetic Brake tensioning system. This model uses a follower arm that rides on the outside diameter of the tape pad. As the tape pad decreases, the follower arm senses the tape pad diameter and decreases the brake torque accordingly. The arm moves out of the way for loading and unloading. 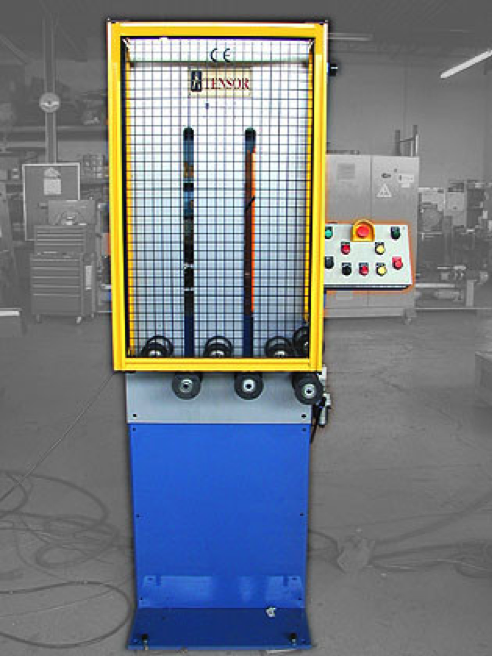 This is an improved tape tensioning system over the basic model. 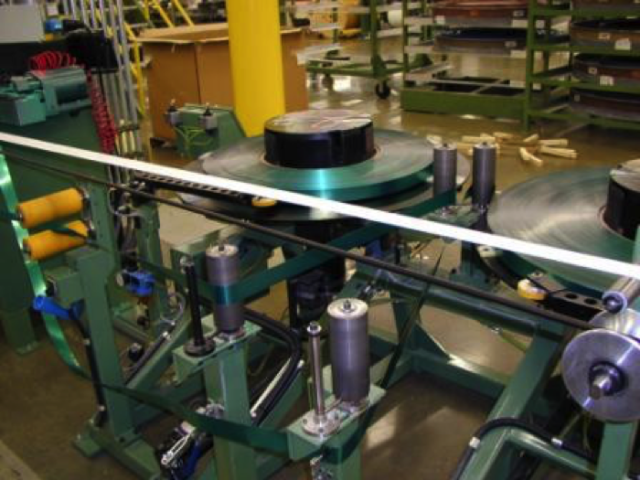 For higher speeds and when tension is critical—such as for aluminum tape—a Motor Driven tape pay-off is required. Each of the discs are driven by their own AC Vector motor. 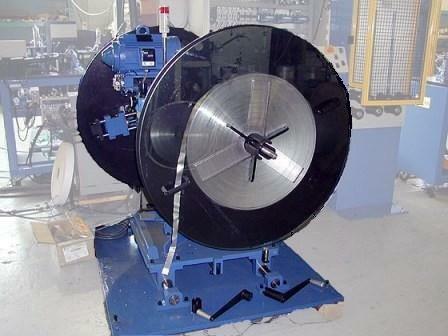 The tape tension and speed are controlled by a tape dancer or a tape accumulator. This is the most accurate tape tensioning method and is consistent throughout a run. This is available in the swivel design or the single pay-off models.